When Pope John Paul II died in 2005, millions of pilgrims flocked to Vatican City for his funeral. The huge crowd began chanting “santo subito!” or “sainthood now," demanding that their beloved leader of the Catholic Church become a saint immediately. Normally, a case for beatification can only be opened five years after death, but Pope John Paul II was put on the fast track to sainthood. Pope Benedict XVI did away with the waiting period, and had an official panel begin investigating possible miracles attributed to the Polish Pope. A Vatican commission unanimously agreed in January that John Paul II had performed a miracle by curing a French nun of Parkinson's Disease. With a verified miracle attributed to him, Pope John Paul II became eligible for beatification, the penultimate step to sainthood. With two million pilgrims expected in the Eternal City for the momentous occasion, many Roman business are raising their prices. 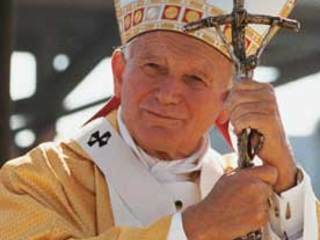 Here are tips for coming to Rome for the beatification of Pope John Paul II. The date chosen for the beatification has complicated the issue of finding a place to stay. May 1st is a public holiday in Italy, meaning that many will have the day off from work- inflating the size of the crowd. Hotels in Rome have raised their rates in anticipation of the high demand. Many two-star hotels are hoping for 330 euros ($447) a night, but since 2011 rates were published last year, hotels can face fines for raising prices now. Many hotels have been booked at full capacity for weeks but there are alternatives for lodging in and around Rome. Airbnb offers private lodging and sublets by the day. A quick search by city will show what is still available in Rome. Those are a tight budget can try volunteer-based CouchSurfing. On the site, users offer up their couches to strangers for free- just be sure to check their profiles for reviews from other travelers. The May 1st ceremony will be held in St. Peter’s square. The event is free and no tickets are required. During Pope John Paul II's funeral, crowds stretched down to the banks of the Tiber, so plan on going early to get a spot in the square. St. Peter's Square will open at midnight the night before the ceremonies. An American tour guide is currently under investigation for charging pilgrims 166 for fake tickets, so be aware that there may be some scams taking place. In addition to taxis, Vatican City is easily accessed by metro and bus. You can use Rome’s transportation website to plan the best route. The site is available in English here. Make sure to always validate your ticket on the bus to avoid fines! There will be a candle light prayer vigil held on April 30th in Circus Maximus. Mass will be given in St. Peter’s Square on May 2nd. The Swiss Guards will be out in full force during the events in Vatican City. Consider taking an exclusive tour of the Swiss Guard barracks to learn more about the history of the smallest army in the world. The Vatican will be incredibly busy in the days surrounding the momentous event, so exploring other parts of the Eternal City could offer a little release. For an amazing view of Rome, climb Castel Sant’Angelo, which the previous Popes have used as a fortress during attacks on Rome. To get away from the crowds, you could take a quick day trip to Via Appia. Jesus is said to have appeared to St. Peter on this ancient Roman road. Want to avoid large crowds and high prices? You can watch the beatification ceremony anywhere in the world via Vatican Radio’s live streaming. The ceremony will be broadcast online on the Vatican's official website. The Catholic Church has been creating a stronger online presence in recent years, so you can even stay up-to-date with John Paul II related events on the Pope's facebook page. Looking for more tips? You can ask for specific advice in our forum, where Italian residents are happy to share their expertise.